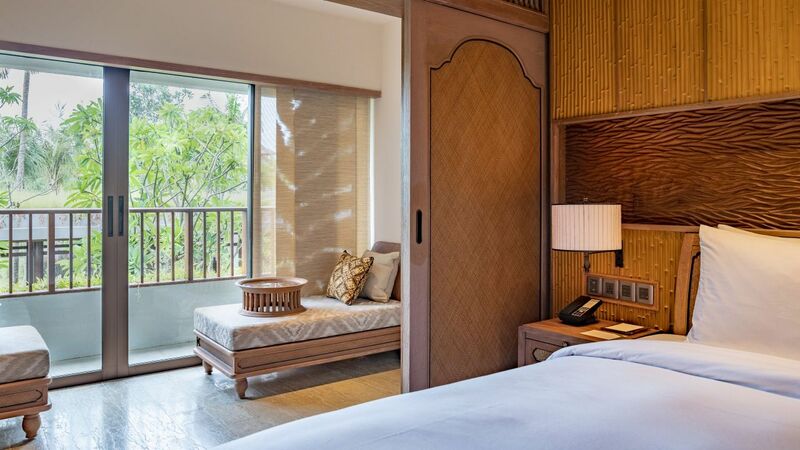 Each of our 363 rooms in Hyatt Regency Bali is designed with a modern Balinese touch and overlooks the lush garden or calming Indian Ocean from the private balcony. Families will enjoy our Suite selection, including the Executive Suite with its spacious rooftop balcony – a truly unique experience in Sanur. Maximum guests per room: 2 adults and 2 children under 12 years old or 3 adults. Designed for comfort, the family suite features 54 sq m of space, a king bed and comfortable living room. Located on the 4th floor, the suite has one of the best views in the resort with ocean view and manicured Balinese garden. Regency Club Access is included. Maximum guests per room: 2 adults and 2 children under 12 years old or 3 adults. Find tranquility within this space of 54-78 sq m with a master bedroom, large en-suite bathroom, as well as living and dining area overlooking lush garden landscape. Regency Club Access is included. 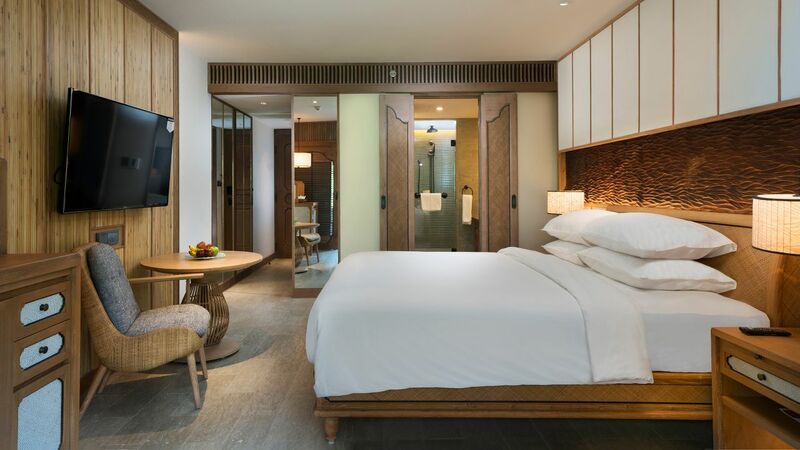 Maximum guests per room: 2 adults and 2 children under 12 years old Relax amid traditional Balinese ambience in 81 sq m with a master bedroom, large en-suite bathroom, as well as living and dining area overlooking lush garden landscape. Regency Club Access is included. 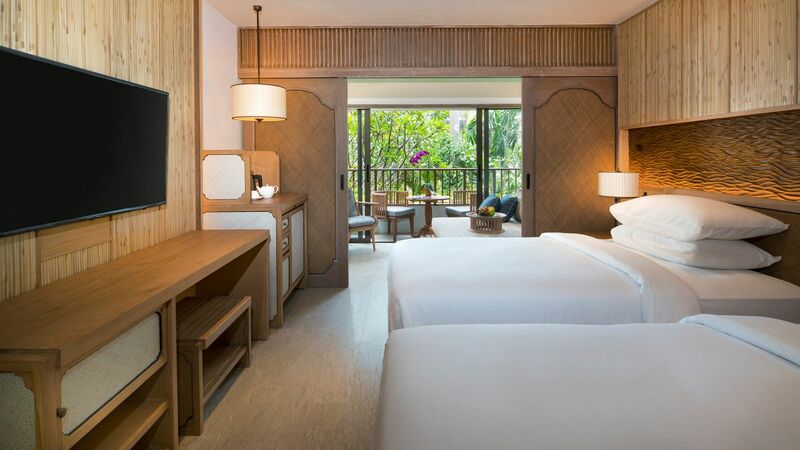 Maximum guests per room: 2 adults and infant Relax in this comfortable room featuring a king bed and 27-34 sq m of space with a modern Balinese touch. Each room comes with a cabana and private balcony, where guests can enjoy the serene view of garden or ocean. 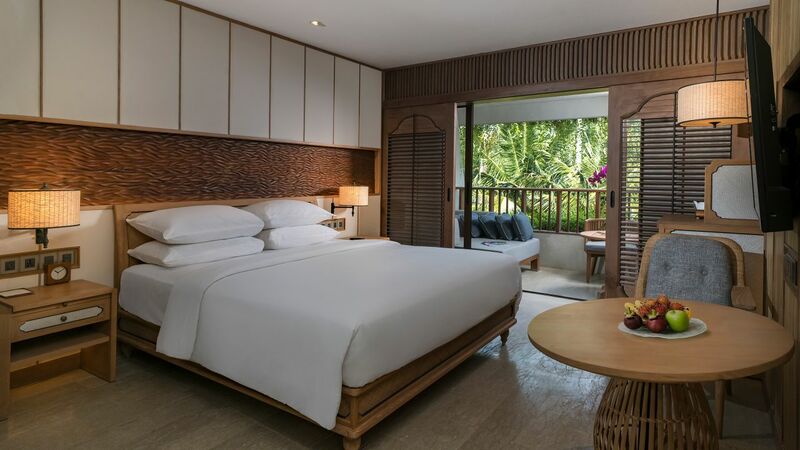 Maximum guests per room: 2 adults and infant Relax in this comfortable room featuring two twin beds and 27-34 sq m of space with a modern Balinese touch. 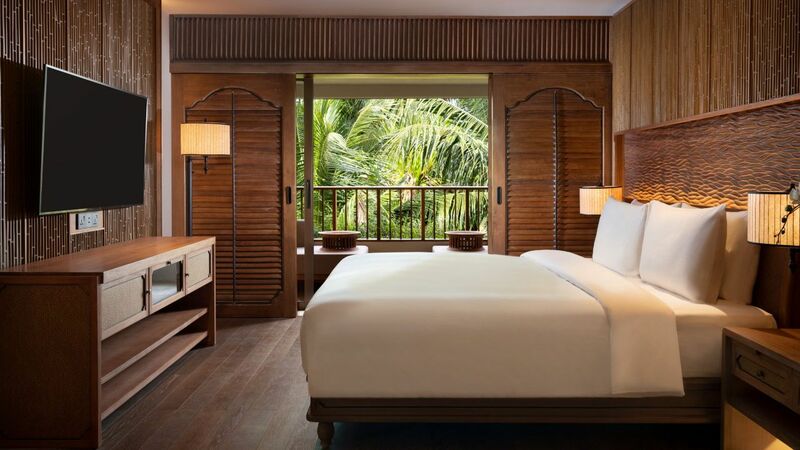 Each room comes with a cabana and private balcony, where guests can enjoy the serene view of garden or ocean. Maximum guests per room: 2 adults and 1 child under 6 years old Our king bed Deluxe rooms features 34 sq m of space, cosy décor and private balcony. Enjoy amenities such as luxurious bathroom and complimentary Wi-Fi to make your stay more comfortable. Maximum guests per room: 2 adults and 1 child under 6 years old Our twin bedded Deluxe rooms features 34 sq m of space, cosy décor and private balcony. Enjoy amenities such as luxurious bathroom and complimentary Wi-Fi to make your stay more comfortable. Maximum guests per room: 2 adults and infant Enjoy the soothing Indian Ocean view from the privacy of your balcony. With 27-34 sq m of space and a comfortable king bed, modern amenities and tranquil ambience, this room offers instant relaxation. Maximum guests per room: 2 adults and infant Enjoy the soothing Indian Ocean view from the privacy of your balcony. With 27-34 sq m of space and comfortable twin beds, modern amenities and tranquil ambience, this room offers instant relaxation. Maximum guests per room: 2 adults and 1 child under 6 years old Take in the beautiful sea view from this 34 sq m room featuring a plush king bed, private balcony and multifunction desk. 1Maximum guests per room: 2 adults and 1 child under 6 years old Take in the beautiful sea view from this 34 sq m room featuring two twin beds, private balcony and multifunction desk. Maximum guests per room: 2 adults and infant Recharge in this 27-34 sqm king-size room and enjoy the lush garden view from the charming balcony. Enjoy Regency Club privileges such as continental breakfast, canapés, and concierge services. Maximum guests per room: 2 adults and infant Recharge in this 27-34 sqm twin room and enjoy the lush garden view from the charming balcony. Enjoy Regency Club privileges such as continental breakfast, canapés, and concierge services. Maximum guests per room: 2 adults and 1 child under 12 years old Recharge in this 27-34 sqm room featuring a plush king-size bed and enjoy the beautiful sea view from the charming balcony. Enjoy Regency Club privileges such as continental breakfast, canapés, and concierge services. Maximum guests per room: 2 adults and 1 child under 12 years old Recharge in this 27-34 sqm room featuring plush twin beds and enjoy the beautiful sea view from the charming balcony. Enjoy Regency Club privileges such as continental breakfast, canapés, and concierge services. 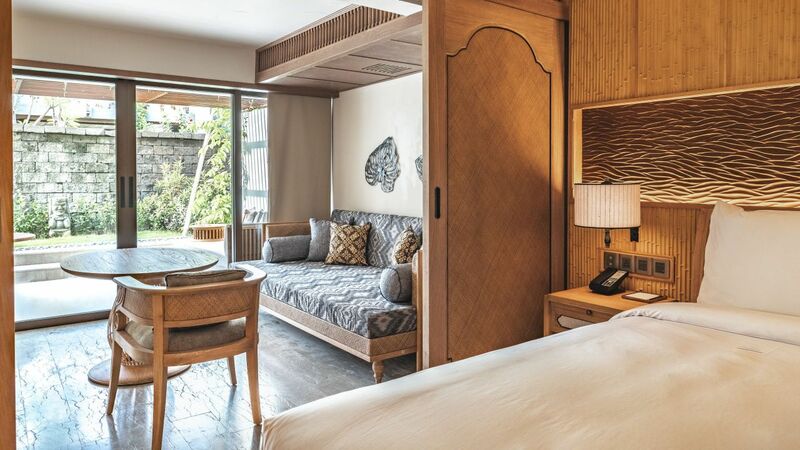 Maximum guests per room: 2 adults and 1 child under 6 years old Relax comfortably in this 34 sq m room with a king-size bed, marble floor, inspired by Balinese design elements. Enjoy Regency Club privileges such as continental breakfast, canapés and concierge services. 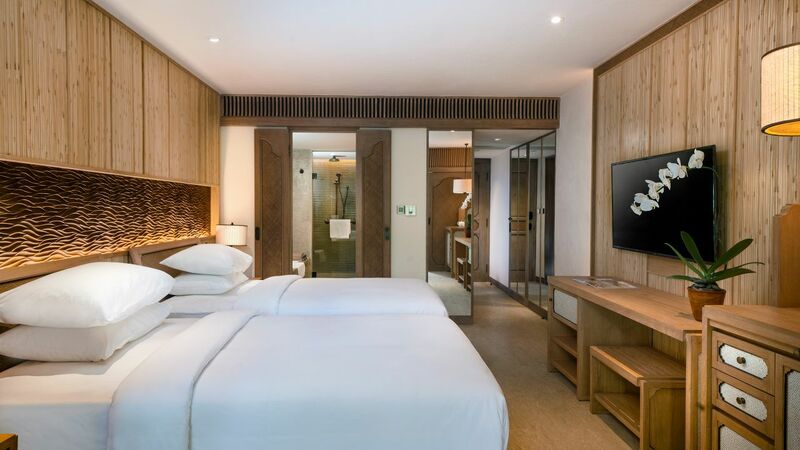 Maximum guests per room: 2 adults and 1 child under 6 years old Relax comfortably in this 34 sq m room with two twin beds, marble floor, inspired by Balinese design elements. Enjoy Regency Club privileges such as continental breakfast, canapés and concierge services. Maximum guests per room: 2 adults and 1 child under 6 years old Enjoy the extra space in this 34 sq m room featuring a plush king-size bed, cabana and partial ocean view. Enjoy Regency Club privileges such as continental breakfast, canapés, and concierge services. Maximum guests per room: 2 adults and 1 child under 6 years old Enjoy the extra space in this 34 sq m room featuring plush twin beds, cabana and partial ocean view. Enjoy Regency Club privileges such as continental breakfast, canapés, and concierge services. Maximum guests per room: 2 adults and 2 children under 12 years old or 3 adults. 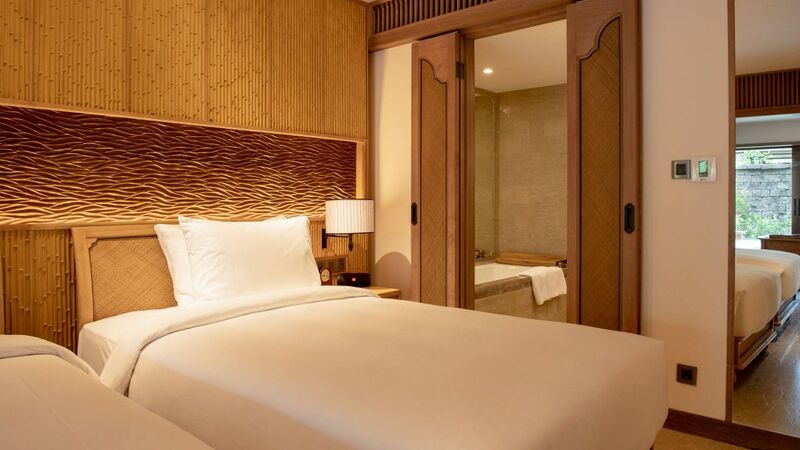 Enjoy the extra space in this premium room featuring 39 sq m of space, a king bed with fine linen, cabana and partial ocean view. Enjoy Regency Club privileges such as continental breakfast, canapés, and concierge services. Maximum guests per room: 2 adults and 2 children under 12 years old or 3 adults. Enjoy the extra space in this premium room featuring 39 sq m of space two twin beds with fine linen, a cabana and partial ocean view. Enjoy Regency Club privileges such as continental breakfast, canapés, and concierge services.